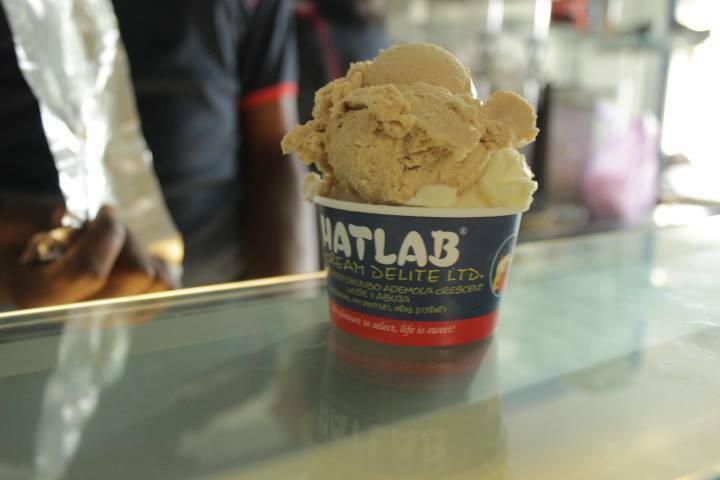 When i first heard the name Hatlab, i immediately imagined a cybercafe…definitely not an icecream and snacks parlour. So on one hot afternoon, a friend and I strolled into Hatlab Place in zone 5 for some icecream. Each scoop is 300 naira so we ordered 3 scoops each, I got the caramel, coffee and mango flavors while my friend got the mango, vanilla and bubble gum flavors. We also ordered a marble fruit cake (300 naira) and a hot dog cheesy pretzel (250 naira). The icecream was absolutely delicious, one thing about Hatlab is that they have quite a number of flavors compared to a lot of icecream places I have been to in Abuja. Also there is often an aftertaste that some ice cream have but Hatlab tastes fresh and creamy. I have been back several times since this visit and the service is always super. The hot dog pretzel is the first I have seen in Abuja and it was quite delicious. I am a huge marble fruit cake fan ( well i am a huge cake anything fan but that is besides the point) and it was so soft and absolutely yummy. Hatlab is definitely a must visit for anyone in Abuja, i believe they have a kiosk in the Silverbird Entertainment Centre as well..Pay them a visit!